Steinhaus slot actually stereotypes a different nationality other than the Irish, this time the Germans. Not that we haven't seen this before with WMS' 'Bier Haus' and its derivative 'Heidi's Bier Haus' and it's likely that you will be reminded of those when opening Stein Haus up as the symbols are quite similar. Now the graphics are pretty plain with wooden reels and a bar in the background and we've lost the 'wheedle' sound from Novo's typical wheedle-and-trot noises, instead getting a blast of Bavarian 'oompah band' music as we play. 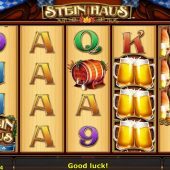 So can Stein Haus put some froth into our bankroll or will we be left feeling flat and bitter? We pay 50 coins per spin given that we get 50 paying lines over 5 reels of 4 rows each. Symbols are stacked bar the scatters and all can award a full screen which may come in useful given the low 5-of-a-kind awards. The Beer Jugs are Wild and pay 20x bet for the 5, Barmaid 8x, Singer 6x, Barrel or Bratwurst (sausages!) 4x with six card values at 2-3x. 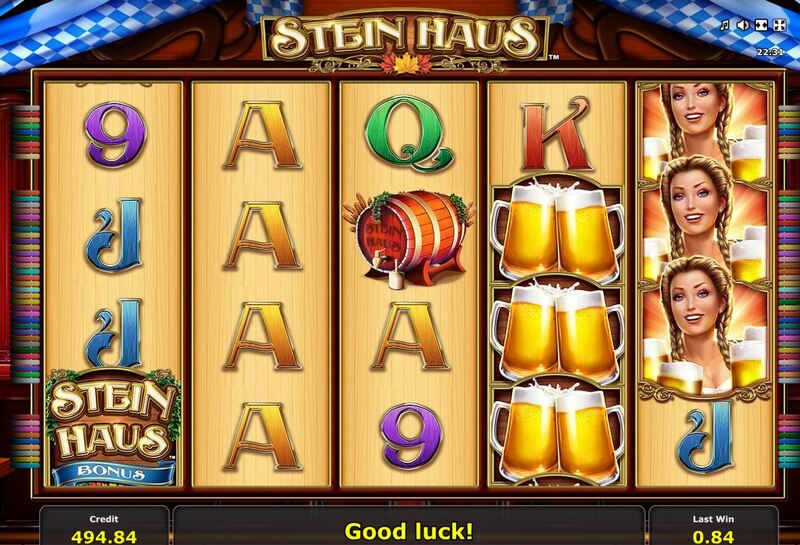 There are no random in-play events but if we see 3 Stein Haus logo scatters we do get a bonus round which is hwre you are most likely to see the game's top pay, 1000x bet for a full screen of Wilds! Having acquired 3 Stein Haus scatters you are taken to another set of reels without scatters, so there goes your retrigger. Don't worry too much about that as you still get the stacked Wilds, plus on each reel 3, 4 and 5 you will see a 2-row Beer Jug Wild moving about during all of your 10 spins. This may land fully in view on all three of those reels or just exposing 1 row on all three or any combination in between. This means that any matching stacks on reel 1 and 2 will almost certainly pay a win of some description across several lines and therefore your chances of wild lines are enhanced too. Oh, and of course you will have the oompah music to accompany the spins and images of lederhosen in your head as well.